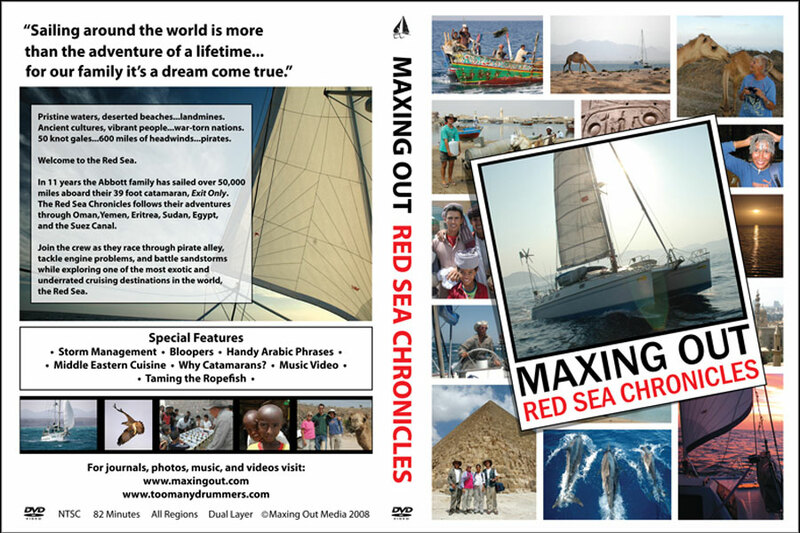 MULTIHULL DVDS OF SAILING VOYAGES AROUND THE WORLD. CAPTAIN DAVE. Over the years. 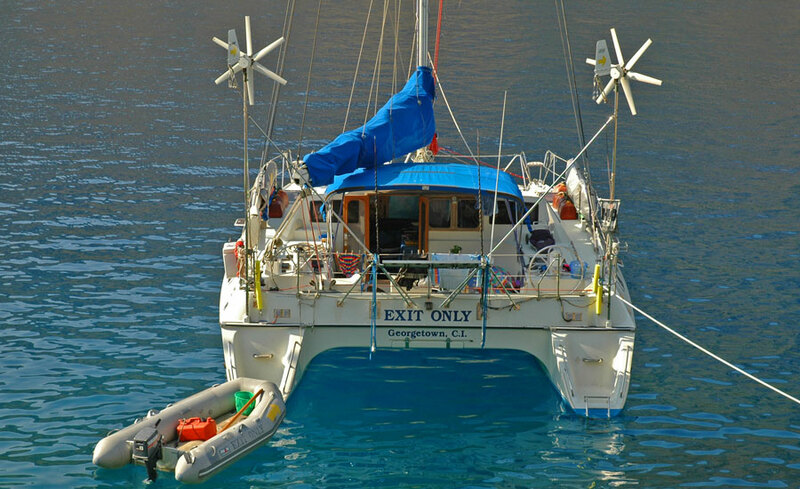 quite a few folks have asked us where we came up with name "Exit Only" for our catamaran. This is the way it happened. While I was working in Saudi Arabia, whenever we went on vacation, we had to obtain an Exit-Reentry visa in order to make the trip. The Exit visa got us out of the country, and the Reentry visa got us back in to resume our work. There was a special type of visa for people who were leaving the Kingdom of Saudi Arabia and not coming back. Those folks received an Exit Only visa. Once you went Exit Only, your work in the Magic Kingdom was over, and you were on a one way ticket to some place other than there. I worked for eleven years in Arabia, always traveling on my Exit-Reentry visas. 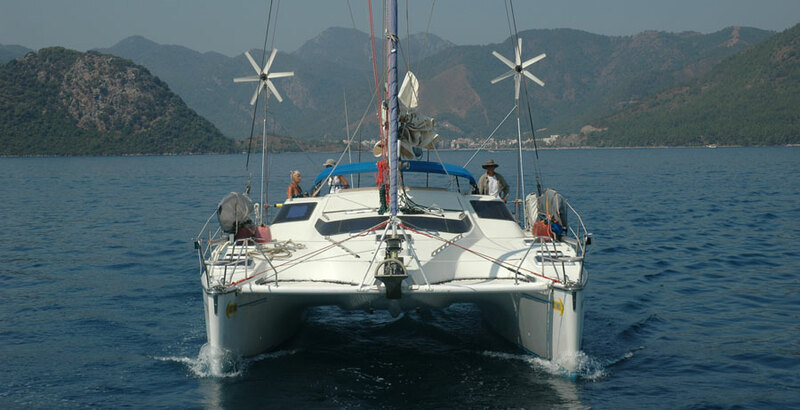 Finally, at the end of the eleventh year, it was time to sail on the ocean of my dreams, and so I got an Exit Only visa and went sailing on Exit Only around the world. Going Exit Only on board Exit Only was a liberating experience. The scraping, scrounging, and saving were over, and it was time to live my dreams. 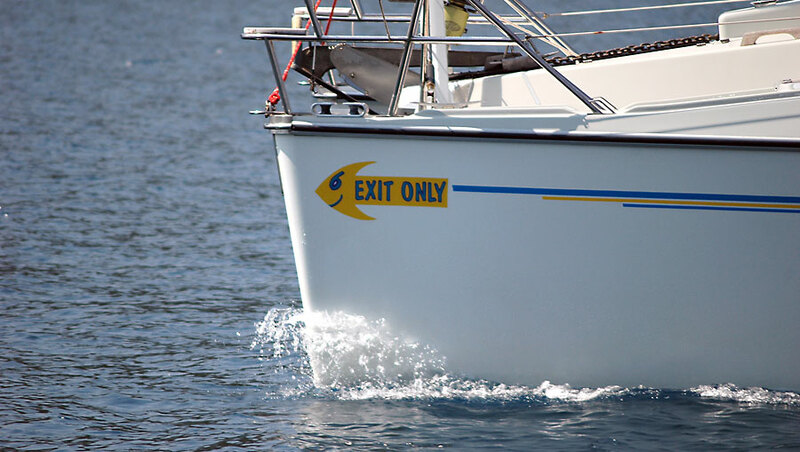 Exit Only proved to be a good name. It constantly reminded me that my old life was gone, and that I wasn't going back. It was time to move forward into new territory. I had a new life, and I was a new person. 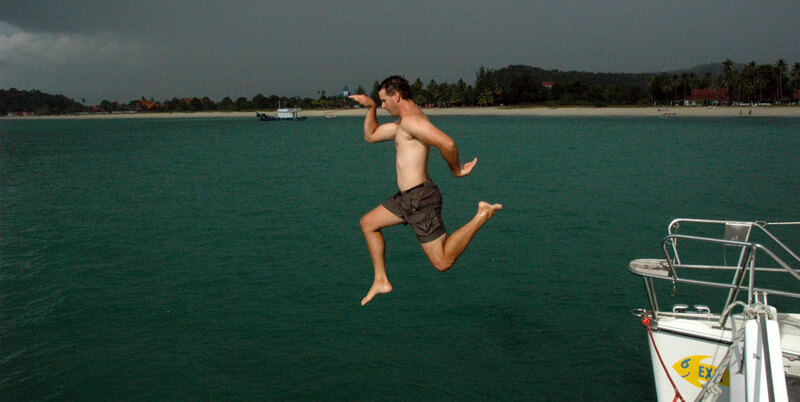 I was now Captain Dave, Master and Commander of Exit Only, and it was time for 33,000 miles of global adventure. 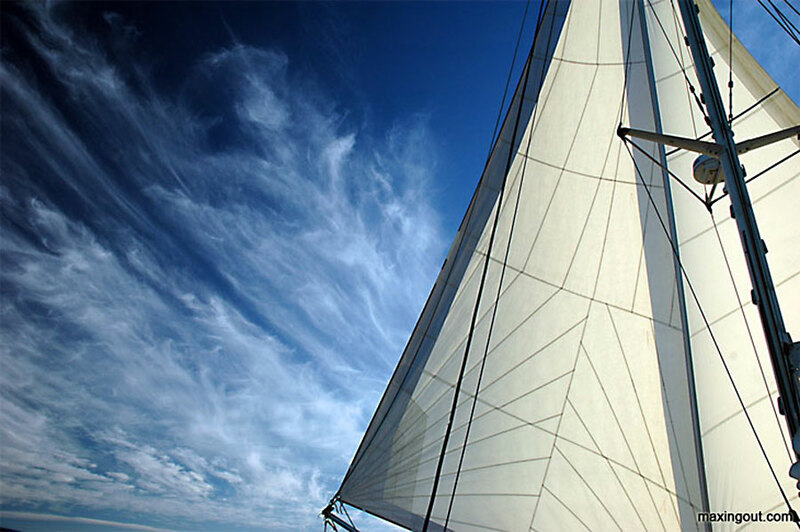 When you sail at night, take a good look at the midnight sky. You can see billions of miles and millions of light years in every direction. From the beginning of time, astronomers have searched the sky for signs of life, and so far the only place where life is known to exist is on planet earth. Earth is unique because it’s chock-a-block with life; it’s everywhere, and it’s relentless. It’s in the air, on the land, and in the depths of the sea. The reason earth is such an awesome place is because it’s a sanctuary for life in an otherwise hostile universe. 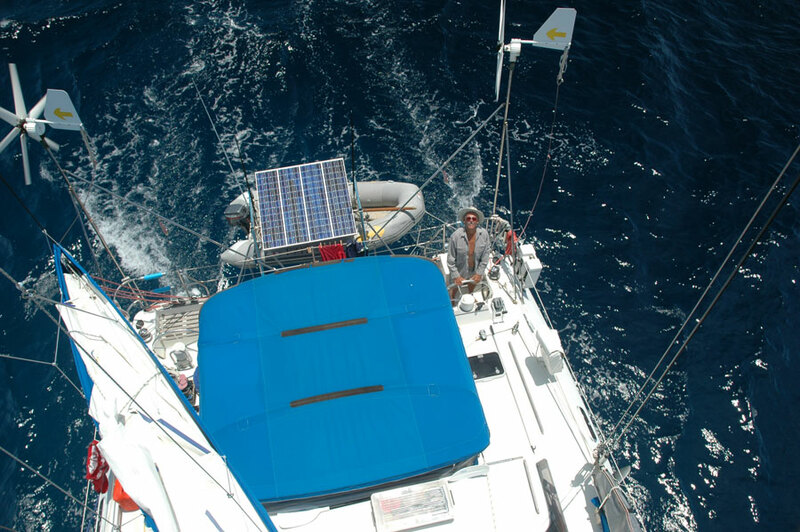 When I sailed around the world, the most important discovery I made was that life is good. Everything that’s alive, including you, is a massive miracle. Don’t waste your time complaining about the things in your life. Forget about your woes and worries, and instead, focus on the miracle of life You are a miracle and you live in a miraculous world. Click on this button to tell your friends about "Life Is Good". After living outside the United States for twenty-eight years, I am finally connected. At least that's what everybody tells me. You see, I completed my circumnavigation around the world on my sailboat, I'm back in the USA, and I now have a cell phone. Being connected does have it's benefits - I do get to talk to my family whenever I want until I run out of minutes or money. When you're connected, you enter into a time warp in which time is split into two dimensions. The first dimension is called "ANYTIME MINUTES", and I am only allowed to visit this dimension for five-hundred minutes a month. Apparently this dimension is very crowded, and they won't let me stay longer unless I pay more money. The second dimension is called "NIGHTS AND WEEKENDS." I can do whatever I want for as long as I want in this dimension, and it doesn't cost anything extra. I don't want to complain about my new life, but I confess I liked my old one better. I got along fine without a cell phone, and I was connected to other things that talked to me and sent messages without sending a monthly bill. I hope I don't get disconnected from my old world; that would be selling my birthright for a bowl of porridge. I am going to have to come to a new agreement with life. I already miss being connected to the trade winds, the sea, the stars, porpoises, and pilot whales that I communed with for the past eleven years. During those years I didn't have to split my time into anytime minutes, nights, and weekends. I was connected to everything I loved all the time. My old world had plain vanilla minutes that worked just fine, they didn't cost anything, and I didn't have to sign a one or two year contract to make it all happen.